THOUGHTSKOTO Thoughtskoto : Have a PH Passport? Here's 62 Countries, Territories You can Visit Visa-Free this 2018! Have a PH Passport? 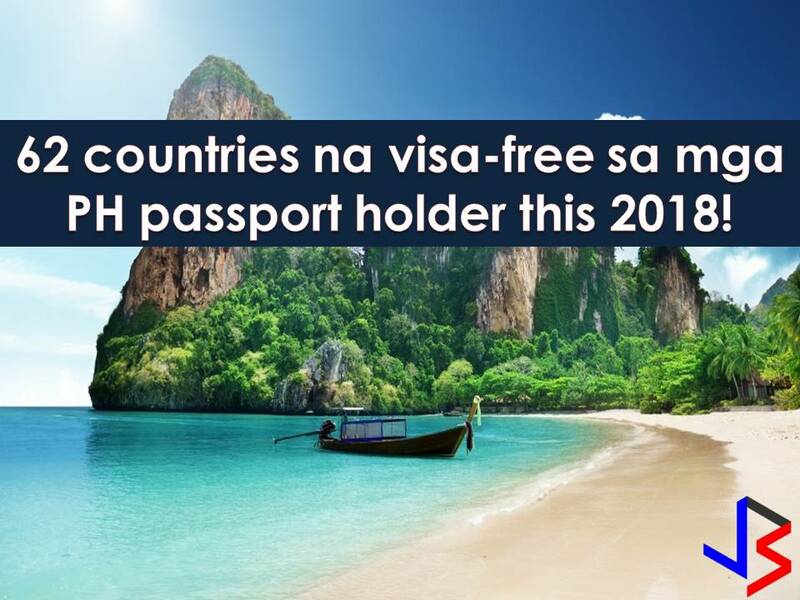 Here's 62 Countries, Territories You can Visit Visa-Free this 2018! Filipinos love to travel, not just here in our beautiful country but also in different countries around the world. To go out of the country, one most important document you should have is the Philippine passport! And if you already have it, don't you know that you can enter 62 countries and territories without the need to apply for a visa before leaving? Yes, it is! From ranks 66 last year, Philippine passport now is one step higher and land in rank 67th according to the Passport Index. So this 2018, here are the countries you can visit visa-free or visa on arrival! Some of this countries are Philippine's neighbor in Southeast Asia where breathtaking views are waiting to visit like Thailand, Cambodia, Singapore, Hong Kong Indonesia, Vietnam, Malaysia and many others! This year, Germany is top on the list were German passport holders can enter 161 countries visa-free. Singapore, Denmark, Sweden, Finland, Italy, France, Spain, and South Korea shared at the number 2 spot. Afghanistan was on the bottom list with visa-free access to just 25 countries. There you have it. As they said, work hard and travel harder!